Today was Day #2 of Chocolate and Coconut Theme Week. 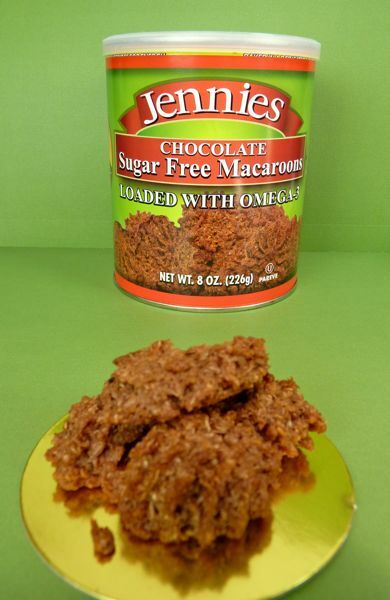 These Chocolate Sugar Free Macaroons, from Jennies Gluten Free Bakery (Moosic, PA), were free of a number of things (lactose, wheat, gluten, casein, soy), but packed with surprisingly good taste and texture. I enjoyed the fresh coconut taste of these macaroons, and a slight, but very appealing, crunchiness from flax seeds/meal. Sweetened with maltitol (a type of sugar alcohol), I detected no artificial flavor that I've experienced with some other sugar free products.